This new edition of The National Geographic Our Fifty States Reference Book. written by author Stephen F. Cunha, is categorized as a children’s reference book, and includes fascinating illustrations, highly detailed maps, and compelling essays written by members of Society’s Geographic Alliance Program. Kids will discover the captivating details behind each state’s unique history from Maine to Hawaii, and from Florida to Alaska. This remarkable reference book is packed so full of engaging information and fantastic visuals that children will never run out of things to learn about. The book also includes special features like essays about the District of Columbia and territories, a list of additional resources, numerous comparative charts, and a detailed index. – 8 1/2? x 10 7/8? The easy to read physical maps display each US region followed by intriguing essays and fascinating information about each area’s history, natural resources, climate, and physical features. 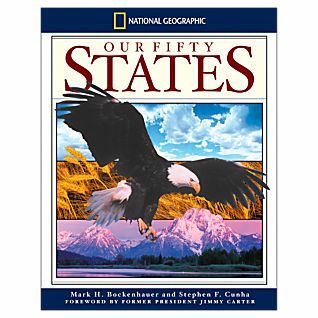 Children can also explore highlights from individual states within each chapter through illustrated historical time lines, state-at-a-glance boxes, photo essays, and full color political maps with this National Geographic Our Fifty States Reference Book.